Calystegia sepium.© 2001 Janet Novak.ct-botanical-society.org. (Accessed 4/2014). 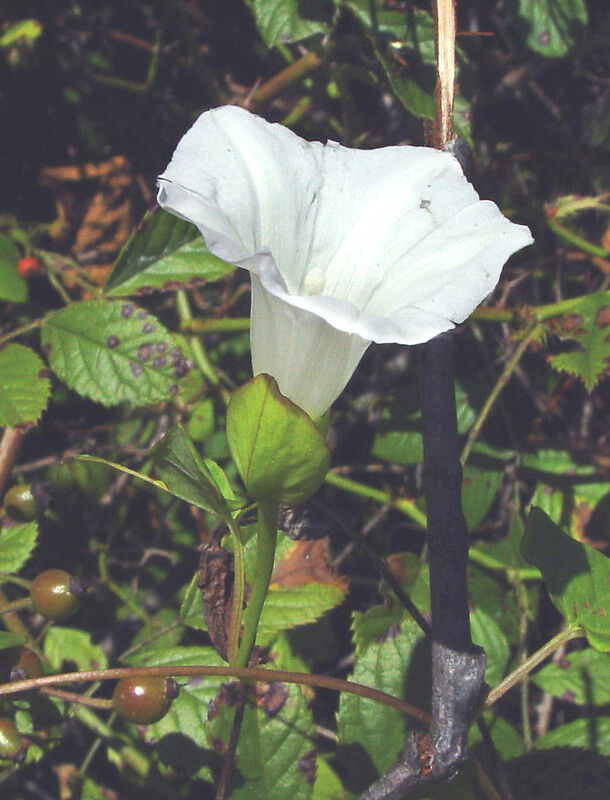 Calystegia sepium is a perennial, herbaceous, twining vine, to 3 m long, stems slender, green, branching; colonial from an extensive system of fleshy rhizomes. Leaves alternate, stalks elongate, blade 5-10 cm long, 2-6 cm wide, arrow-shaped with squared off lobes at base. Calystegia sepium. (flower bracts) Copyright © 2014.Arthur Haines.New England Wild Flower Society.gobotany.newenglandwild.org (Accessed 4/2014). 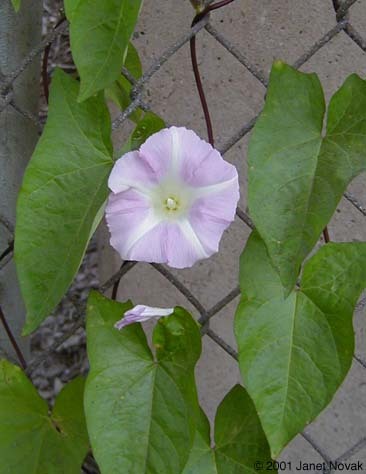 Flowers pink-white, often striped, showy, radially symmetrical, funnel-shaped, 4-7 cm (like morning glories), 5-7 cm wide (Radford et al. 1968, inconspicuously 5-lobed, base subtended by 2 bracts, 1.5-2.5 cm long, heart-shaped to oblong, enclosing sepals, ovary superior, stigmas 2, elongate; solitary in leaf axils, flower stalks (peduncles) as long as leaves; blooming June-Sept.
Calystegia sepium Seed pod and seeds. By Leo Michels. © FloraFinder.org. florafinder.com (Accessed 11/2017). 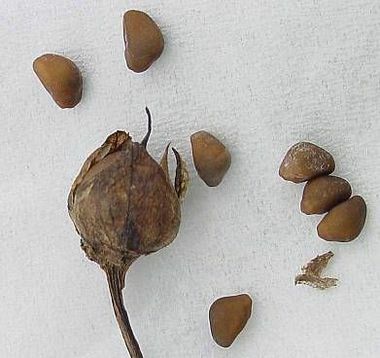 Fruit dry, hollow, a 2-celled capsule 0.8-1 cm wide, enclosed in old floral bracts, splitting open to release 2-4 seeds (USDA 1971). 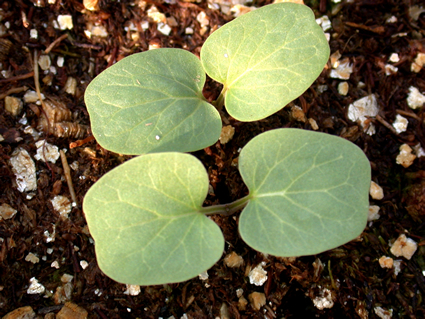 Seedling leaves somewhat square, notched at tip, base lobed. Habitat: Open areas, edges, roadsides, fields. Calystegia sepium seedling. Cornell University Weed Ecology and Management Laboratory. weedecology.css.cornell.edu (Accessed 11/2017). Notes: Differs from Convolvulus spp. in having two large bracts below the calyx and concealing it. Twining over other vegetation, may shade out and kill smaller plants. An agricultural pest. Prefers rich, moist soil (Uva et al. 1997). Listed as invasive by the USDA (USDA, NRCS 2006).